This spacious two bedroom cabin is tucked into the woods right off the main road and close the shopping and dining of Midtown. The pine tree views from the living area are so pretty! Enjoy grilling, dining, and relaxing on the deck. 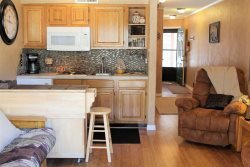 BAILEYS, MAMA BEAR, and PAMELA'S are side by side, so if you have a larger group that would like to be close, yet have your own place to relax at days end, then these are the cabins for you! Baileys Cabin accommodates 5 guests. Mama Bear Cabin accommodates 5 guests. Pamela's Place accommodates 6 guests.